Notes: Felt a little tired going into today's training session, but my body was feeling good. Might have had an iffy night's sleep. Knowing this going in I was cautious of the bar speed on the way up and perceived exertion. Had 255lbs. in mind to go with my work sets today, and after 4 tough sets, I got to 255lbs. and hit 3 solid singles there before moving on. Front squats felt great today with my calves loose. Bar speed was good through and I was keeping a good torso angle. Pistols were so much better than last week. The calf mobilities that I have been doing are money. Didn't push too hard this session as I knew I had one more to go today. 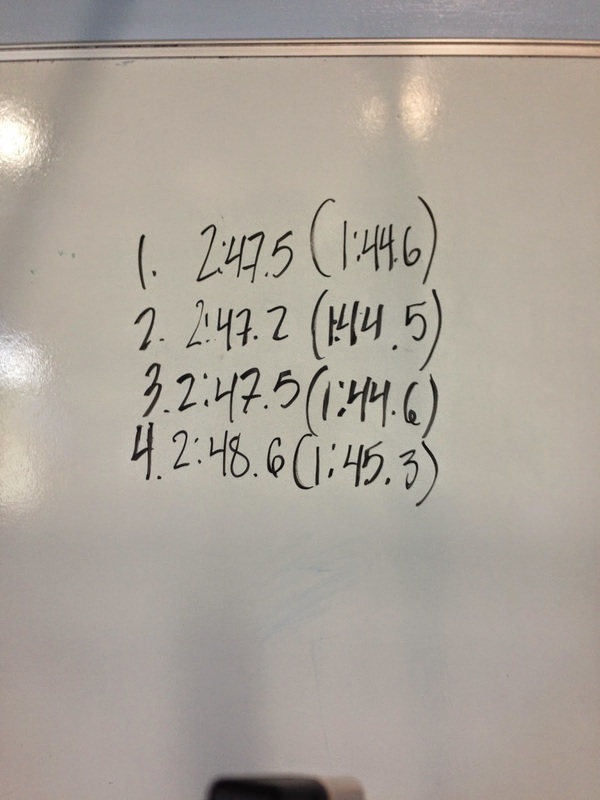 Notes: Had limited time to warm-up for this one but I didn't really need all that much of a warm-up because it was over 90 degrees inside the gym when I hit this one. First two sets weren't too bad but just couldn't sustain the kick on the last two. Legs were just smoked. I was disappointed with the last interval. I tried going out easy and then pick up the pace but I just wasn't able to kick it into gear at the end. I am thinking for events 10min or less I need to push the pace and hold on. Whereas longer events, I think I can ease my way into it a bit more and pick up the pace as I go.